Some might say that in GESAB were obsessed by ergonomics. And theyre right. We are so worried about people that we always put humans on the top of our list when we design command centers and control rooms. I AM part of a group that designs office furniture for Anthro in Tualatin, Ore. We often visit companies to observe how people work. We want to know whether theyre experiencing any difficulty with their work flow, what helps them work more efficiently, how their bodies move in their space and how they adapt in their work setting. We design solutions intended to alleviate any problems. Its important to have a space of ones own, even in an open environment. Bringing in items from home and adding color and textures helps the office aesthetic. There is more to employee comfort, however. Thanks to laptops and cellphones, workers have become more mobile. Many are no longer tethered to their desks the way they were when PCs and phones had to be plugged into the wall. They dont have to meet at long tables in conference rooms anymore, either. A lot of newer offices have less structured areas designed for collaboration. Ergonomic tools help employees collaborate. Traditionally, if two people were trying to view a Web site or a computer program on a PC, one person sat while the second stood and bent down to see the screen. Or the second person might pull up a chair and lean over. Today, there are articulating arms for monitors, jointed extensions that allow thin monitors to be raised or lowered by about a foot. Theyre helpful if two or more employees want to view a computer screen simultaneously or if people dont want to work in one position all the time. If they have height-adjustable desks, they can push their chairs back and stand, raise the desks and monitors, and view the screen at a comfortable height. Standing while working has received attention lately. Many people feel sluggish after lunch, and standing can get the blood flowing again. Some people say that standing helps them be more productive. Your whole body is active. Its like an afternoon pick-me-up. Modifying your office furniture yourself can also increase your comfort level and, hopefully, your productivity. Youd be surprised  some low-cost solutions are actually quite effective. Ive been in offices where people have propped their monitor on a cardboard box just to raise it to a more comfortable viewing height. It might not be aesthetically pleasing, but its better ergonomically. Companies often invest a lot of money in chairs, but in many cases employees are still sitting at fixed-height desks. Some employees have to raise their chairs so much to reach their work surface that their feet dangle. A few bring in a plastic milk carton as a footrest. People find various ways to adapt, but in the end some compromises can lead to injury. Companies will buy a $1,500 office chair because they equate price with value. But its more about fitting the chair to the individual. You wouldnt buy a pair of shoes that didnt fit, so why buy an expensive chair that isnt really right for you? A chair is only one piece of the puzzle. Good furniture design takes into account that were not all the same size. Designers start by looking at charts with data on average sizes of men and women and progress from there. Incorporating electric or mechanical aids into products allows people to raise or lower the furniture easily. When we design products with these features, we consider peoples weight and their ability to adjust the height. A womans center of gravity may be different than a mans, so female nurses using a cart made for a hospital may struggle when making such adjustments. I bring a female perspective to the design process. Weve studied a range of creative work environments. For example, weve found that video editors like to be tucked into a horseshoe-shaped workstation that accommodates their monitors and other equipment. They settle in with all this equipment practically wrapped around their bodies. 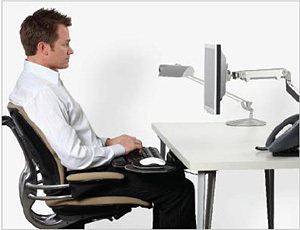 Many tilt their monitors and the front section of their desk and work in a partial reclining position. Often, they use multiple input devices including a mouse, a keyboard and a pen tablet, which is attached to a PC and operated by using a stylus pen. It functions like a mouse but captures hand gestures. I HAD a back injury six years ago, and it has influenced my point of view. Because I had pain while recuperating, I think Im more conscious of how other people, especially those with health issues, would like to work. I can sympathize with the discomfort of having to sit or stand for long periods. My goal is to provide a healthy work environment from the start, to catch someone before he or she needs an ergonomic solution for a specific problem. To me, the ideal work setting fits the task to the user as opposed to trying to fit the user to the task. Its also dynamic, allowing the person to move around, to rearrange items of furniture and to stand for a few minutes. Repetition and monotony  using a desk and chair in the same position every day  are anathema in an office setting. If you have the right environment, youll be a happier, healthier person and a more productive employee. As told to Patricia R. Olsen. E-mail: preoccupations@nytimes.com.